This post first appeared March 2, 2013. 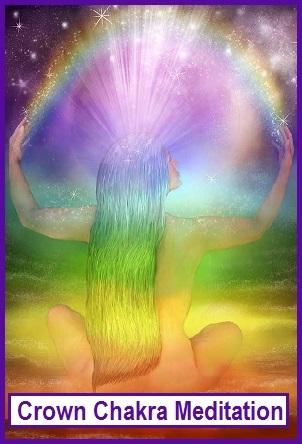 I find when working with clients that many times their Crown Chakra needs balancing. 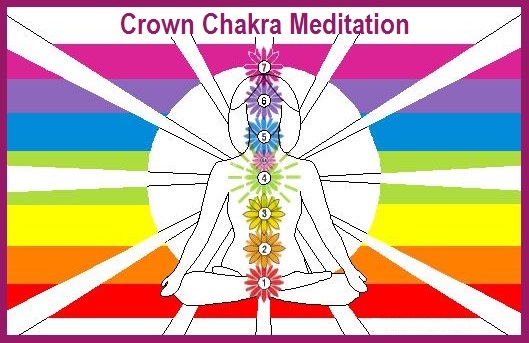 The following lovely meditation for balancing the Crown Chakra was introduced by Sue Windred. This would be an excellent chakra meditation to record in your own voice, reading slowly and allowing for pauses where appropriate. (The author’s spaces below indicate pauses). “Sit back comfortably with your back straight, take a deep breath and breathe out all your tension. Imagine yourself on a grassy patch on top of a hill. Looking up you see a beautiful rainbow in the clear blue sky. All the colors are clear yet blending into each other. As you gaze at the rainbow you feel it coming towards you. You watch as it gets closer until it is above your head. Sitting there you feel the colors absorbing in through your Crown Chakra. Feel the red going down to your Root Chakra. The orange going down to your Sacral Center. The yellow going down to your Solar Plexus. The green going down to the heart. The blue going to the throat. The indigo going to third eye. And the violet to your crown. This chakra balancing meditation can be used whenever and as often as you like.